Following up on the map published in the centerfold of the SFBG, an organization no less profound than CITY LIGHTS is helping us publish an even larger, grander version of the Bikes to Books map to help celebrate the 25th anniversary of the streets renamed after San Francisco authors and artists. The bike tour, led by Nicole Gluckstern, gathers in South Park 10:30 and leaves Jack London Street at 11. I will be holding down the fort at City Lights, leading the readings that start at 2 at Jack Kerouac Alley. I’ll be the guy dressed as reading an excerpt of Jack London. Here’s a clip of the map — it’s basically what you’d expect from a a Burrito Justice post, but on paper (18×24) and double-sided. 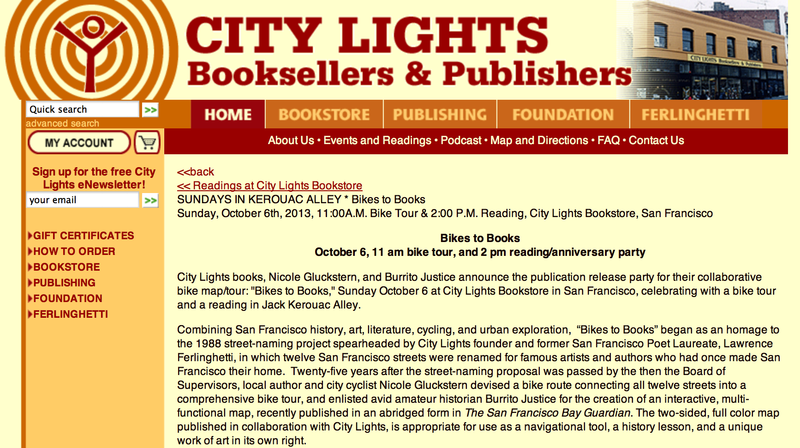 City Lights books, Nicole Gluckstern, and Burrito Justice announce the publication release party for their collaborative bike map/tour: “Bikes to Books,” Sunday October 6 at City Lights Bookstore in San Francisco, celebrating with a bike tour and a reading in Jack Kerouac Alley. Combining San Francisco history, art, literature, cycling, and urban exploration, “Bikes to Books” began as an homage to the 1988 street-naming project spearheaded by City Lights founder and former San Francisco Poet Laureate, Lawrence Ferlinghetti, in which twelve San Francisco streets were renamed for famous artists and authors who had once made San Francisco their home. Twenty-five years after the street-naming proposal was passed by the then the Board of Supervisors, local author and city cyclist Nicole Gluckstern devised a bike route connecting all twelve streets into a comprehensive bike tour, and enlisted avid amateur historian Burrito Justice for the creation of an interactive, multi-functional map, recently published in an abridged form in The San Francisco Bay Guardian. 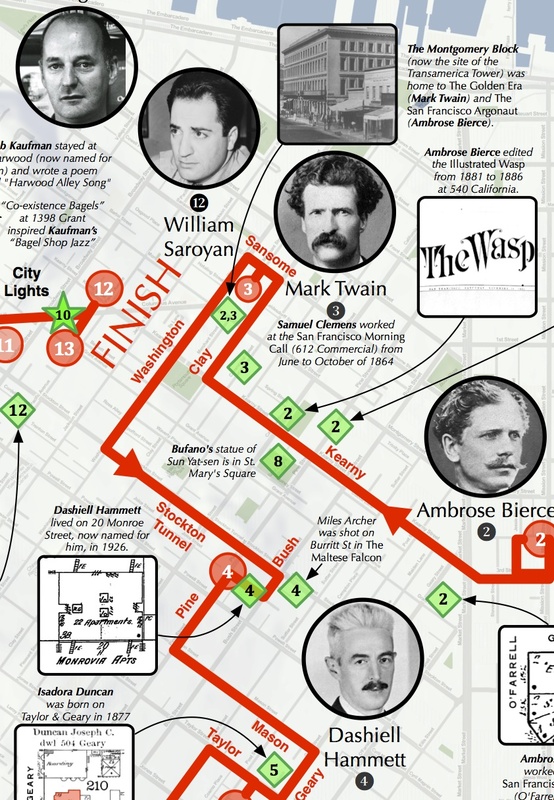 The two-sided, full color map published in collaboration with City Lights, is appropriate for use as a navigational tool, a history lesson, and a unique work of art in its own right. 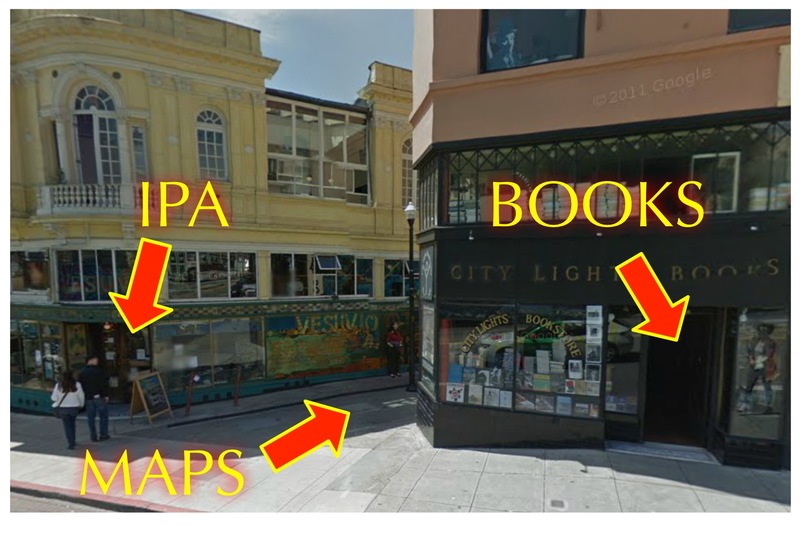 Meet in Jack Kerouac Alley from 2-4 pm for a celebration of the 25th Anniversary of the Street-naming project and a release party for “Bikes to Books” map, sponsored by the City Lights Foundation. This is still on my calendar, but there has been a movement within our ranks to break away and join the HSB faction in the park. “But it’s books!” I proclaim. “But it’s biking!” I shriek. “But it’s beer (in the pannier)!” I plead. We will see who wins. If I do make it, I rock a helmet with sharks on it.